We are a Houston based breeding program known for producing exceptional and exemplary Egyptian Arabians. We at Callegari have a great love for the Arabian horse - admiring the beauty and athleticism of this amazing breed. We respect that every breed of equine is special for its own redeeming qualities and we appreciate that certain breeds have been custom tailored to excel in certain riding disciplines and equestrian sports. As Straight Egyptian breeders, we truly enjoy being able to create our little group of Cale' foals that represent what we believe in. It is absolutely true that we have a passion for the rare and exotic. However, nothing is more important than function - because good form begets superior function. his is because we ride our horses alongside all breeds of equines and in many different disciplines. It is not only beauty that we seek to create in our Callegari Arabians - we seek to create intelligent, athletic horses that are as willing and gentle as any other. ​Cale' Thee Xtreme is the founding stallion of our breeding program at Callegari and stands as our Premier Stallion. We love to see our horses find their forever homes! 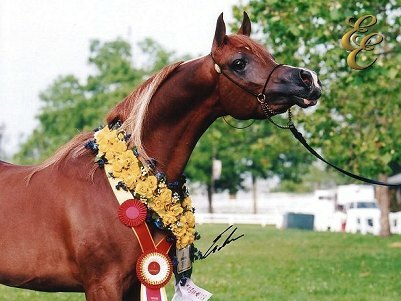 The Callegari Breeding Program has an Arabian horse of many different attributes! Come see some of our pride and joys!